This grape is gaining ground on consumers' tables all over the world. It stands out for being easy to drink, with a great colour, soft tannins, and mainly low alcohol content, a distinctive feature in the face of new trends. Bonarda is a variety blessed with great winemaking potential in Argentina and it is considered the second most important red grape, behind Malbec. 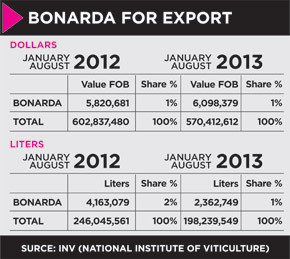 The country is the only producer of this grape; therefore it is a varietal wine with no competition. Another distinctive factor is that it grows successfully in all the regions of Argentina, showing its uniqueness in each of them. Pedro Pelegrina, winemaker of Casa Montes winery, from San Juan, explained: ‘it is characterised by giving good yields, when it has a productive vegetative balance.’ Like González, he spotlighted the intensity and colour, as well as red fruit aromas, making this product really appealing when it is young. Finally, he added that Bonarda’s tannins are always soft, making it easy to drink. Despite the fact that people worldwide associate Argentina with Malbec, there is also a need to diversify the supply by means of other grapes or blends, but always maintaining the identity of the country. In order to strengthen its position, it is important that wineries manage to create wines with a particular identity. It should also be considered as a great partner to blends, especially Malbec. 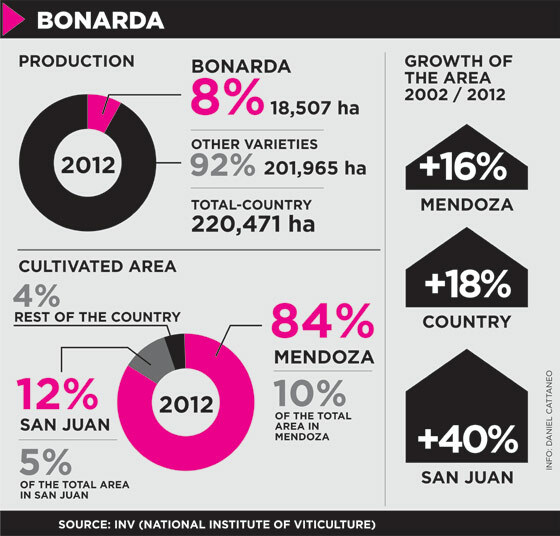 This grape variety has managed to be recognised by the international press, and Argentine Bonarda wines have received excellent scores from magazines from all over the world.